Burning of 18 persons, Salzburg. Engraving by Jan Luiken in Martyrs Mirror, v. 2, p. 17 of Dutch edition. The struggle against the Anabaptists could be carried on with much greater vigor in Salzburg than in the Austrian hereditary lands, since here the temporal and spiritual authority were combined in the archbishop. In Salzburg there were resident Anabaptists as early as 1526. Of Jörg Zeller it is related that he had brought the symbol "which is called rebaptism" to his home in Franconia from Salzburg, and several of the Anabaptists seized early in 1528 in the Bavarian district of Auerbach came from Salzburg; among these were Antoni, who had commissioned Hans Stieglitz to baptize, and Gilg, a former priest, then a leader of the Anabaptists, who had received his commission from Dorfbrunner. The extensive spread of Anabaptism in the bishopric of Salzburg is seen in the numerous mandates as well as the complaints of Archbishop Matthäus, who wrote on 4 July 1527, that he had to work day and night with his councilors to stamp out Anabaptists in his bishopric. One of the mandates warns the populace on penalty of death not to become involved in "such unchristian acts of rebaptism." The judges were ordered to pursue the matter with vigor, and prevent meetings "in which such seducing deeds are perpetrated," organize posses, and especially to proceed against foreigners who were found in these meetings, in accord with the mandate which was to be nailed to the door of the city hall and read in all public places (25 October 1527). In two days another mandate appeared warning against involvement with Anabaptism either in word or deed; books were to be burned; giving an Anabaptist food or shelter was punishable by having the house of the perpetrator destroyed. All Anabaptists from the outside were to leave within eight days. The next decree (14 November 1527) was issued to the pastors of Hallein, Tittmoning, Laufen, and Radstadt, notifying them that two Anabaptists had been punished and several had recanted; it was known that there were still several in the country, and to prevent the spread of their evil doctrines instructions were sent showing the common man how to deal with them, what questions were to be asked of them, and how the recantation formula was to be worded. Suspects were to be questioned concerning any possible communistic ideas, views on government, the deity of Christ, and the Lord's Supper, the number of persons any one might have baptized, the sending out of missioners, their views on the Last Judgment, whether it is possible to be saved without rebaptism, etc. The consequences of the severe persecution in Moravia and Austria on the one hand and Tyrol on the other would naturally be evident in Salzburg. Indications of this are seen in the Neue Zeitung of 1528, whose author claims to have been an eyewitness: "Here (in Salzburg?) the guest Brethren have gathered, preached, and established their rebaptism. Thirty-two persons were surprised and arrested. They would not desist from their errors nor name their brethren and sisters." "Ten of them including their preacher were punished." Those who would not recant were burned at the stake in the Fronhof. Five who confessed their error were beheaded and then burned. A woman and a girl of sixteen, daughter of the goldsmith Georg Stein, the friend and companion of Hans Hut, who could have saved their lives by recanting, were sentenced to death. The executioner took the girl in his arm, carried her to the horse trough, and held her under the water until she died. She laughed at the sight of the water. Cases of this kind were in the mind of the lawyer Hepstein, when he protested to the city council of Augsburg on 25 January 1529, that nothing could be achieved by slaughtering the Anabaptists: "In Austria the young girls come running and request to be put to death." On 1 November four were put to death, among them Wolf Paumann, the judge of Tittmoning; although he recanted and offered to give all his goods he was beheaded. In the same manner three brethren ended their lives in Mühldorf. On 5 November ten women and several men were driven out of the city, although they had recanted. Eleven women and sixteen men together with their preacher were seized at a meeting in a solitary place about a half hour from Salzburg and taken to Halle. Refusing to recant, they were locked into the house where they had met and were burned with it. This was also the fate of two other houses in which the Anabaptists had been meeting. "There are therefore about forty-one persons still languishing in prison," says the Neue Zeitung. The Hutterite chronicles also write of such executions. "The elect saints," writes Leonhard Schiemer on 3 December 1527, "who at this time are praising God in Salzburg and at other places with their martyrdom, must have bathed in tubs of oil, else they would not have remained constant in faith." "Pray to God," he writes in a second epistle, "for our brother Schreiner from Brixlegg, who lies in prison with his wife in Lofer." But there were still some Anabaptists known to be in Salzburg. The watch on foreigners was sharpened. A new directive issued on 4 January 1528 prohibited discussion of Lutheran (Protestant) doctrine with travelers. The archbishop noted that the Anabaptists were moving to Tyrol to gain a foothold. At the same time he informed the administrator of Passau, who had also seized many Anabaptists at this time, of the situation in Salzburg. The penalties of the preceding year were increased. 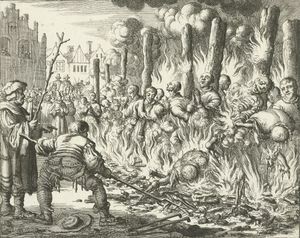 Whereas the previous mandate ordered death by burning for all Anabaptists, those who recanted were to be beheaded before being burned; those who were only misled and had not themselves baptized, but had given food and shelter to the Anabaptists, should be drowned. Now those who gave shelter were to have their houses destroyed, pay a fine, be imprisoned, have their clothing removed, and the foreigners to be placed in the stocks and beaten with rods. All the penalties were defined, even for carelessness in this matter. Thereby Salzburg set the pattern for its neighbors; it was even followed in Nürnberg. Only rarely did an Anabaptist meet a kind fate in Salzburg, such as that of Asmus Gschöll, who after he had finished his prison term appealed to Innsbruck that he should not again be tried for his Anabaptism. Of course, as persecution in Tyrol increased, many Anabaptists returned to Salzburg, causing grave concern to the rulers. On 4 June 1533, Ferdinand I wrote to the archbishop that he had definite information that the Anabaptists were creeping into Rattenberg, Kufstein, Kitzbühel, and into the valleys of the bishopric of Salzburg, and that it was very urgently necessary to send three spies thither at once. The archbishop hastened to comply. Among the Anabaptists there was in general greater activity at this time. Early in 1534 "a goodly number of persons of Berchtesgaden came to Anabaptism," of whom more than twenty persons of property fled. The bailiff of Mosham, Wolf Kentscherner, was instructed on February 16 to arrest these Anabaptists and to look for those who had fled to Lungau. He arrested the mine superintendent Jörg Weisshempt and his wife as Anabaptists. Both begged for mercy; it was granted in return for recantation and security. The bailiff was informed that some, under the pretext of being related to the miners, were able to penetrate far into the mountains, lodge with remote peasants, and fill the people with their teaching. On 6 May 1534, Kentscherner received orders to be doubly vigilant, with reference to events at Münster. A similar uprising was feared at Salzburg, and all measures were adopted to fortify the country as if for war. The archbishop kept himself informed about the progress of events at Münster. All arrested Anabaptists were questioned to establish any possible connections. The statements of the prisoners show very clearly that no such connection existed, for the Anabaptists of the South had little connection with those of the North. Konrad Siebenburger, seized with other Anabaptists, recanted on May 14th at St. Johann. In November an officer of Burghausen reported that he had drowned Margarethe Moser and her daughter Walpurg without trial because they had been rebaptized. In the following year many Anabaptists on their way from Moravia to and through Bavaria were captured in Passau. Among them was a leader, a tailor. Many recanted and were released; others were still in prison. In 1541 and 1542 several Anabaptists were put to death by fire or water. The Hutterian chronicles relate a bit of valor on the part of Leonhard Bernkopf at the stake. "This side is now roast enough; turn me to roast the other side now." . . . "Therefore he will on the other side have a harp in his hands." From Golding the Anabaptists in the spring of 1531 migrated into Lungau territory by way of the Radstatt valleys, and from there to Moravia. In Lungau and in Golding there were still some Anabaptists; their presence annoyed the archbishop. The bailiff of Mosham reported that no Anabaptist passed through the defiles there, though they may have crossed the mountains at some other place. The regulations of 1529 against the Anabaptists were renewed in 1544 and proclaimed in all Salzburg. Nevertheless there were still some present. In 1547 two of them were arrested in Lungau. The great provincial synod of 1549 issued strict regulations against the Anabaptists in general and against their publications in particular. In consequence of the watchfulness of the clergy it became impossible for the Anabaptists to maintain themselves except in the mountains, and they were now in close contact with those expelled from Moravia. A church inspection instituted in 1555 by Archbishop Michael Koenberg revealed some scattered Anabaptists in Golling and Gastein, and a mandate issued in September 1558 gave strict orders that children must be brought to baptism. Concerning the next year the chronicles report that Wolf Maier and a Hueber were put to death with the sword at Tittmoning in the Salzburg district. On 20 April 1567, the archbishop ordered the provost of the Zillertal to evaluate the confiscated property of a citizen who had become an Anabaptist; there were very likely some Anabaptists among the "sectarians" whom the archbishop ordered the authorities of Rattenberg, Kitzbühel, and Kufstein to find and bring to judgment. Of special interest is the story of the clockmaker Veit Grünberger from the Pinzgau, a Vorsteher of the Anabaptists, who visited Tyrol nearly every year after 1564 and held his "revier" in the vicinity of Imst. In 1570 he was seized in a forest in the Pinzgau. His replies in the cross-examination indicate that people of this kind found sympathy not only among the lower classes, but also among the educated. Not until the third year of his arrest was he brought to trial. In the seventh year of his imprisonment, after suffering much misery and tribulation he managed to escape through a window. The castle guards said it was impossible to escape by that route; Veit said, "With God all things are possible." On 1 August 1576, he reached his brethren in Moravia. In July 1573 the archbishop again issued a mandate against the Anabaptists, "because this shameless sect will not clear out of the country." Six years later Hans Zuckenhammer, a smith, and Wolf Raufer, a tailor, who had been sent to Württemberg by the brotherhood in Moravia, were seized in Tipmening and taken to Hohensalzburg; they were released in 1580. Two hymns deal with Zuckenhammer's imprisonment. In the following years the authorities had little trouble with the Anabaptists. Their chronicles are inexact when in the table of martyrs they put the archbishopric of Salzburg in the ninth place: at Salzburg 38, Berchtesgaden 18, Martel-Lofer 2, Ruckeltal 3. On the other hand, the Hutterian chronicles of 1584 again tell of a Salzburg Anabaptist, Leonhard Sumerauer, who was arrested at Tittmoning, having boarded a boat en route to Moravia. He managed to escape at Burghausen, but was recaptured, tortured, and beheaded at Burghausen on 5 July 1585. In his case, too, the attitude of the populace was apparent. When he was told to deny only the doctrines of baptism and communion, Sumerauer replied, "Leave me in peace. I want to die upon my faith." Thereupon the executioner said, "I do not like to put you to death; but if I do not do it, another will." His death was commemorated by the Brethren in a hymn. Great zeal in persecuting the Anabaptists was shown by Archbishop Wolf Dietrich von Raitenau. In a decree of 1 July 1593, he ordered that Anabaptists should be killed by fire and sword, and the property of fugitives be confiscated. The last Anabaptists were no doubt, with few exceptions, wiped out by the Counter Reformation, which had already been carried out in the neighboring Inner Austrian provinces in 1598. Hege, Christian and Christian Neff. Mennonitisches Lexikon, 4 vols. Frankfurt & Weierhof: Hege; Karlsruhe: Schneider, 1913-1967: v. IV: 15-19. Loserth, Johann. "Geschichte der Wiedertäufer in Salzburg." Mitteilungen der Gesellschaft fur Landeskunde LII. Loserth, Johann. 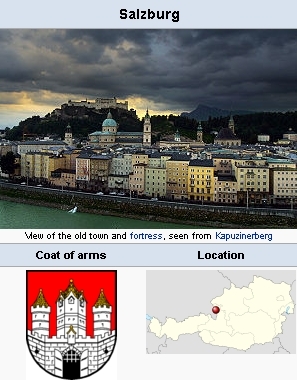 "Salzburg (Austria)." Global Anabaptist Mennonite Encyclopedia Online. 1959. Web. 25 Apr 2019. http://gameo.org/index.php?title=Salzburg_(Austria)&oldid=146714. Loserth, Johann. (1959). Salzburg (Austria). Global Anabaptist Mennonite Encyclopedia Online. Retrieved 25 April 2019, from http://gameo.org/index.php?title=Salzburg_(Austria)&oldid=146714. Adapted by permission of Herald Press, Harrisonburg, Virginia, from Mennonite Encyclopedia, Vol. 4, pp. 409-411. All rights reserved.